It was all Tim Tebow’s fault. He seems to get a lot of credit and blame lately. This is for something pretty cool, though, that hopefully in time will have as much impact as he and his family have in the Philippines. Tebow’s first start was against the Dolphins back in October. It was the start of a winning streak that included 15 points in a little over two minutes. To be there live was amazing!!! My son and I had gone down to Miami for the game with some friends of ours from the church family of which we are a part, along with this guy named George. We picked him up on the way down along the Turnpike. No, seriously, he was visiting with our family from Zambia. I had met him earlier in May, 2011 at an event I was teaching at in Philly. We really connected, and I was so grateful for his encouragement and new friendship. When he was in the states again, he was gonna come and visit with us. 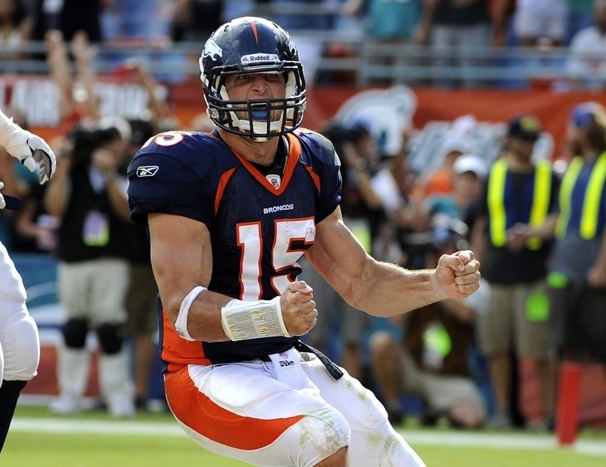 It happened to be last October when that happened, and it happened to be the weekend we had planned to go down to see Tebow and the Broncos face the Dolphins. Equipped with his brand new Tebow T-Shirt, George accompanied this little section of the Westpoint family down to Miami. The night before the game, we ate at an Outback Steakhouse. I like their croutons, but that is not important in this story. A husband and wife who were with us had been praying specifically for the Lord to show them a way that as a family they might give themselves away globally in a long-term, impactful way, impacting hopefully the folks they would serve but also understanding the impact it would have on their family. Well, who knew that the Holy Spirit wanted to have dinner with us at Outback just north of Miami. I guess he likes their croutons, too. By the end of the dinner, that couple looked at each other with that “I guess Zambia is it” look. Fast forward to today. In fact, to exactly an hour ago at 3:30. That husband, along with another husband that walks with them as family of God together, flew out on a jet-plane to Africa. They will be there for a few days exploring possible partnerships and opportunities. PLEASE PRAY FOR THEM AND THEIR FAMILIES, FOR SAFETY, WISDOM, AND DISCERNMENT. I can’t wait to see what comes of this!!! How cool is it that God not only put His love on display for us, but also invites and involves us in getting to give His love away into others, even around the world. And how awesome that God loves us enough to invite us to experience what it is like giving His love away, understanding that we fully live when we fully love, as He has loved us. May we continue to listen to God and do what He says, cultivating daily both among neighbors and nations, inviting a few other folks along for the journey with us.